Tony Horton has it made. His P90X workout DVDs are famous and continue to sell well around the world. He frequently appears on Dr. Oz and other health-related shows promoting his approach to living well. What’s next? A diet plan carrying his name. Tony Horton believes that simple concepts are best. He has a daily workout routine that only takes 10 minutes a day and avoids fancy gym equipment. Now he has an equally simple approach to eating well. The main thrust of the 3 step diet is what Tony calls his “90-10 rule”. That means that you follow his diet rules 90% of the time. The other 10% of the time you get to cheat. Really? Planned-for cheating? What is this? Most people abandon their diet because they find themselves falling off the eating plan. With the Tony Horton 3 step plan, falling off is part of the program! Tony suggests eating five meals a day. Or, you can look at it as eating three meals and two snacks a day. Your choice, but this strategy keeps you from feeling hungry, helping you stay on track. As you might guess, the Tony Horton diet plan has three steps (wow, what a revelation!). Step one is choosing foods with only one ingredient. Clearly, this had to be step one. It wouldn’t work at all as steps two or three. This step means selecting foods without a lot of processing and extraneous ingredients. 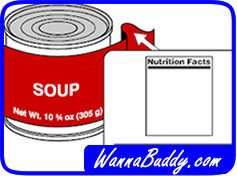 Have you read a Campbell’s Chicken Noodle Soup ingredient list? An endless list of additives and chemicals when what you really want is chicken, pasta and vegetables. Tony’s step one is even more direct: one ingredient per package. Avoiding the additives means avoiding a lot of chemicals and extra calories that move your body in the wrong direction. Step two is “Eat Dirty Snacks.” No, I’m not making that up. You are instructed to eat snacks that aren’t on the diet menu. This cheating takes the pressure off and helps you to stick with the program. Jonesing for a Snickers bar? Your snack time is your indulgence time, so you can get your Snickers on without feeling guilty. Just watch your portion size and everything will work out. Step three is using super-shakes to replace junk food when outside the house. His “power shake” can be mixed up on the weekend and doled out during the week, when willpower is at its weakest. He blends up bananas, berries, almond milk, cashews, and protein powder into a water or coconut water base to make his delicious (his term) shake. So, after a few weeks, what will you see? Tony Horton says that pounds will melt off, without counting any calories. He focuses on controlling portion size but not obsessing over weighing food and trying to count each calorie as you eat it. Coupled with his workout routine, it could result in a slimmer, healthier you!